For our next BIG TICKET DAY offering, we’re going to recommend the Bachmann BLUE LIGHTNING – E-Z APP TRAIN CONTROL train set. We saw this operating system a few years ago at Toy Fair, and we really impressed. This is an HO Train Set that comes with all the track you need, plus the wall power supply and a working deisel locomotive with four cars, plus this set will work with Bachmann’s E-Z-APP controls, which allow you to use a smartphone or tablet to control your train. Enjoy wireless touch-screen control of E-Z App®-equipped trains through your smart device for Android™ or your Apple® (iOS8 or later) smart device and the FREE E-Z App® download. Now you can have speed, direction, lighting, and sound control at your fingertips. Additional features include simple locomotive consisting with speed matching and bonus Christmas programming that that allows E-Z App®-equipped train operation that is synchronized with holiday music. We held off on recommending this set until the App was available for Android devices as well as Apple products, because more people can take advantage of the cool features this way. The way this works is that the device connects via Bluetooth technology to the engine itself, which adds to the fun and gives you more precise control over your train, plus it lets you combine old-school toy trains with high-tech wireless technology. 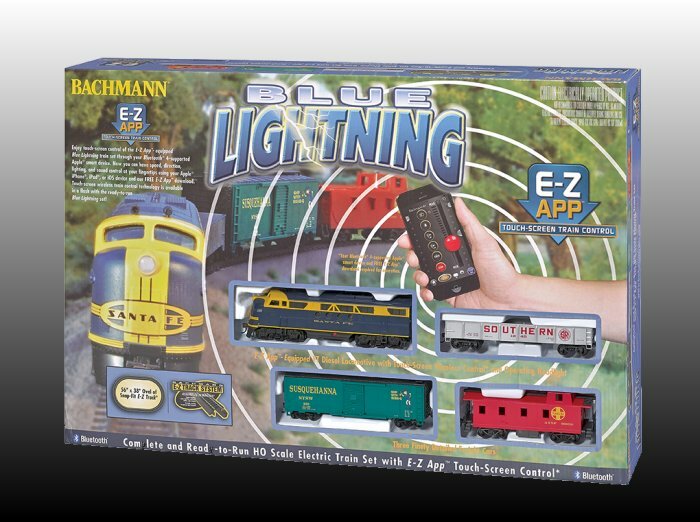 The BLUE LIGHTNING – E-Z APP TRAIN CONTROL train set is $315 if you order directly from Bachmann, but you may find discounted prices at other online or local retailers. Remember, Google is your friend. Recommended for the tech-savvy toy train fan on your gift list.